Last summer the family and I (Wood Matters Ed) at last took on the Timber Trail after hearing many people "rave" about it. This is one of mountain bike trails in the Rail Trails NZ series. Located mostly in the Pureora Forest Park just north-west of Lake Taupo, this 85km mountain bike trail is rated grade 3 for the first 40km and grade 2 for the last 45km. It is usually ridden by starting at Pureora village and finishing at Ongarue. The first day involves a reasonably solid climb most of the way up Mount Pureora, and a rewarding downhill to the Piro Piro campsite where most riders camp for the night. The official website (www.thetimbertrail.com) will fill you in on all the details you need to know to plan a trip. Pureora forest has a fascinating history from being almost entirely wiped out by the Taupo eruptions some 1800 years ago to being exploited for valuable native timber from around the turn of last century. It is now enjoyed for its ecological and recreational value. 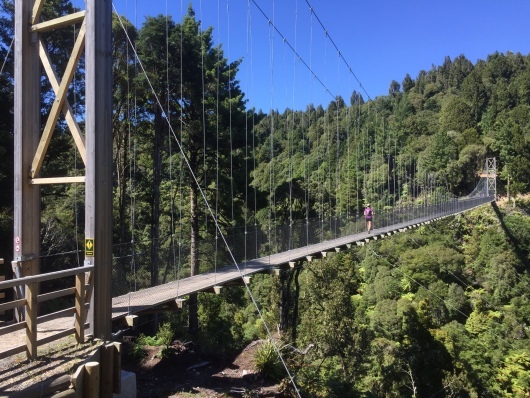 Anyway the point of this story in Wood Matters is to highlight the 35 bridges, including 8 suspension bridges, which are a main feature of the trail, not only for preventing the need to ply one's bicycle down and then up steep gullies but also for the aesthetic beauty of these structures. The longest suspension bridge is 141m and towers impressively over a steep-faced valley. The abutment towers are constructed from CCA treated glulam beams with bracing in the form of CCA treated Radiata pine cross pieces (see photo). The deck is constructed from CCA treated Raditata pine boards. The whole superstructure is suspended on wire ropes and bound and fixed by galvanised steel bolts and fasteners. Often described as the world's second-best wood, this use of Radiata pine showcases its versatility. For these bridges, it would be hard to find a better alternative, especially for the price. The wood's durability (after treatment), strength-to-weight ratio, machinability/workability and ability to be glued all add up to a material that has enabled the Department of Conservation to construct a series of beautifully functional bridges that are enjoyed by thousands of keen New Zealand and overseas mountain bikers each year.